Like most teens in the 80’s, I had a poster of the Lamborghini Countach super-car on my bedroom wall and spent countless hours dreaming about how it would be to drive one of these exotics. This opportunity came years later, but not with a Countach. It was in the all-new Huracán, which, hands down, is one of the most beautiful cars designed so far in the 21st century. When a friend called me and said “I’ve lined up a drive in Lamborghini’s newest offering,” I instantly thought about all of the years I waited for my first drive in a Lamborghini. Was it worth the wait? I was to find out just a few hours later when a striking yellow Huracán was delivered to my office. Of course, time with the Huracán was limited, so I bolted out of my chair and off I went. 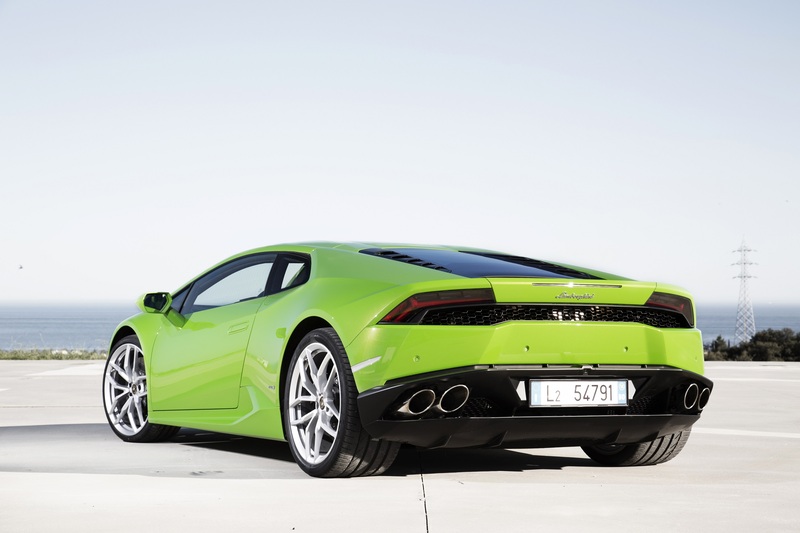 Seeing the Huracán for the 1st time you instantly notice the perfectly executed proportion in design. 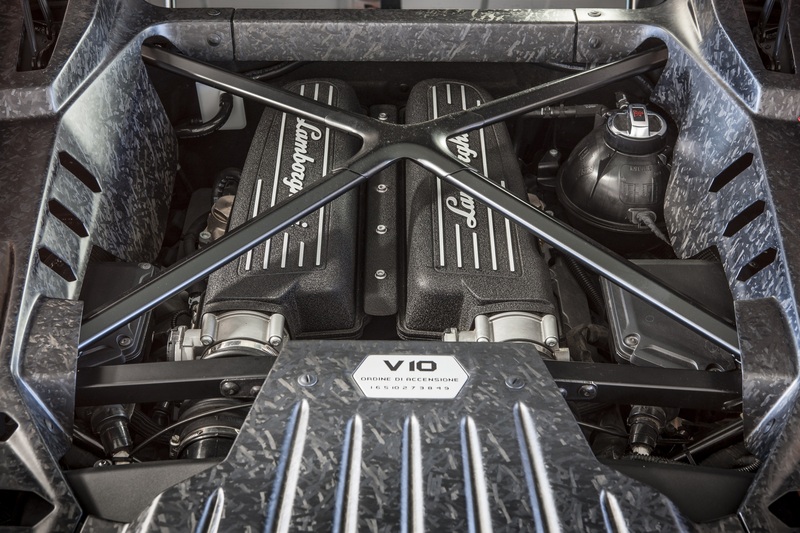 Prominently featuring outrageous jet fighter-like lines and details that a Lamborghini should have, yes, it is also refined, comfortable and even easy to drive. Gone are the days of having to compromise on any of these features in order to have a super car. Bravo Lamborghini! “Huracán” in Spanish is not just the word for Hurricane, but also a mythical name for the god of fire wind and water. At first, Lambo aficionados raised an eyebrow, wondering why the factory strayed from naming their cars after famous bulls. Ah, here is the interesting part, it just so happens that in 1879 there was a fierce bull in Alicante by the name Huracán. Yup, Lamborghini wins the award of having the coolest car names ever! Hands down! Starting the engine is an experience in itself; as you press a center dash mounted red button, the high-speed starter whines, followed by a glorious symphony of 10 cylinders orchestrating their mechanical concert right behind you. Gear selection is done by the industrial-looking left and right paddle shifters. 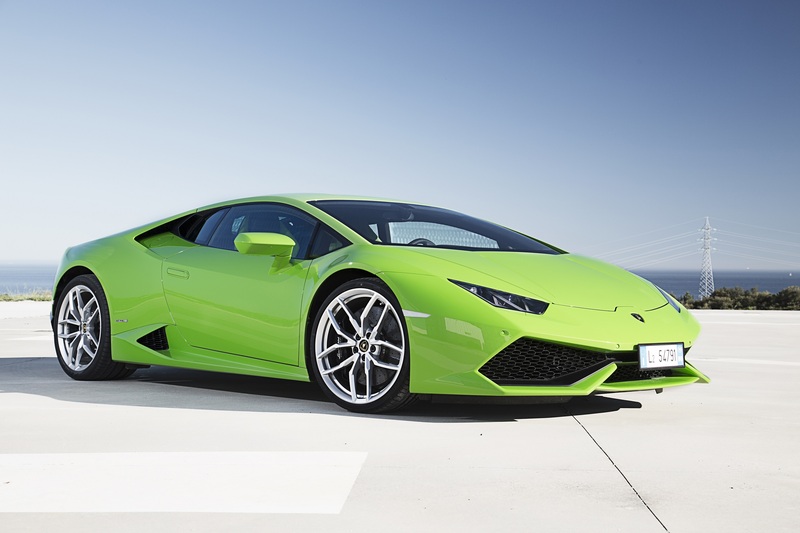 These engage the seven speed LDF, which translates into “Lamborghini Doppia Frizione” or Lamborghini Dual-clutch system. 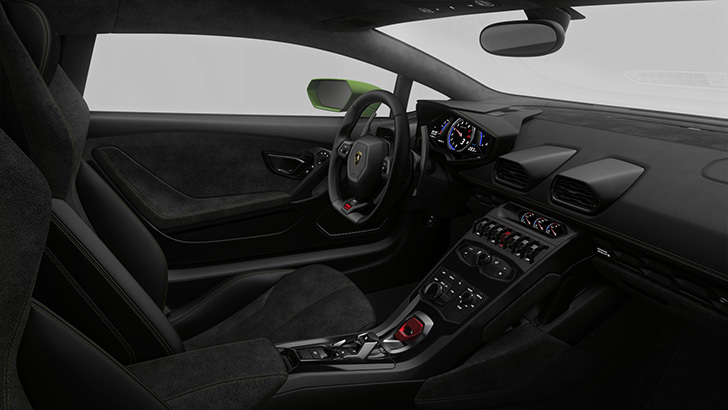 A digital indicator in the center instrument binnacle informs the driver on the selected gear as well as which of the three driving modes is engaged.The interior has benefited greatly from the invisible yet present hands and deep pockets of Audi, offering a cool industrial look with unheard of fit and finished by previous Lamborghini standards. The A/C blows cold air and the seats feel as if you are wearing the car not merely riding on the seat. Of course, being a super-car, there are some challenges. The rear visibility is the size of a mail slot, fortunately once reverse is selected, there is a backup camera that shows you what you can’t see. These are selected by using the “Anima” switch located at the bottom of the steering wheel. “Anima” (Adaptive Network Intelligent Management) or Soul in Italian, offers three choices: “strada” “sport” and “corsa” settings. These change the vehicle dynamics as well as the exhaust sound which are pretty cool features. Additionally, there is the center-dash mounted switch that raises the front of the car in order not to scrape the low hung front spoiler. Nice touch! Steering is surprisingly easy to live with, especially at low speeds, offering superfast agility and a very tight, London Taxi-like turning radius, wow, a super-car you can live with in an urban environment, awesome! Heading out into traffic, I gave the throttle a short burst and instantaneously, we were doing almost triple-digit speeds. Throttle response is explosive, immediate and linear. This is the type of car that feels more like a mind-reader who knows your every move even before you do! Simply think about an open slot in traffic and the Huracán magically complies. It begs to be driven hard and aggressively, and unfortunately, in Miami doing this, is next to impossible. “Effortless” and “civilized” seemed to be words I kept repeating over and over as I drove this incredible car. It’s comfortable, easy to drive, and a rolling work of art. What else can you ask for from a modern super car? Popular Options: Integrated navigation, reverse sensing system, front & rear, heated front seats, speed sensing steering, adaptive suspension. ← Like good wine, it keeps getting better and better!